Women are experiencing a conscious awakening that is intuitively guiding them to seek alternative ways to address their professional, personal and spiritual needs. As a woman enters the wisdom years, the wise woman arises within her to a more profound awareness of her personal authenticity and intuition yet can become confused to outdated belief systems regarding both. Intuition is the gift of inner knowing, that gut feeling you experience when confronted with the need for direction and guidance in life. Personal authenticity comes from the ability to relate, communicate and connect with one’s Highest Power, or what we call the Authentic Self. The Wise Woman rises to the power of her Intuitive Authentic Self with the merging of her intuition through the power of her Authentic Self. Through my Empowering Reiki Experiences and Retreats, I discovered that many of my clients were seeking to trust their own intuition and understand it more fully. Many were receiving intuitive guidance messages with a lack of understanding or belief system to accept, interpret or trust them. Many recognized that the intuitive guidance they received required them to make positive life changes and mind shifting in order to attract opportunities for professional and personal success. When clients learned to trust and tap into their own Intuition, they began aligning with and connecting to the energy of their Authentic Self and Voice. As my clients became attuned and aligned to their Intuition they began asking for greater clarity and simple tools they could use every day to develop a deeper connection and communication with their Intuition. How Is Empowered Intuition Development Offered? Empowered Intuition Development is provided as one hour, integrative, intuitive phone sessions where you begin to align and awaken to the power of your Intuitive Authentic Self for clarification and direction on the pathways of our wisdom years. As this personal energetic alignment begins with your Authentic Self, your Intuition will awaken to guide you with clarifying and empowering solutions for decision making and in identifying personal disempowerment and empowerment within your life. As you awaken and align with the energy of your Authentic Self or your Highest Power, you will learn valuable steps on how to tap into your own Intuition for daily guidance, direction, and self empowerment. Empowered Intuition Development will teach you how to recognize and tap into the gift of the Wise Woman, your Authentic Self which is the powerhouse of your Intuition. Within each of the Empowered Intuition Development Sessions, you will receive the keys to unlocking the power of your own Intuition, with core action steps to bring greater understanding and connection to the power of your Authentic Self. Empowered Intuition Development teaches you to identify, connect, and align with the powerful energy of your Authentic Self within you. It is this powerful connection within where we receive our intuitive guidance and directions. As we work together tapping into the power of your Intuitive Authentic Self you will begin to recognize and trust your own empowered intuition for direction and guidance within your personal, professional and spiritual life. Daily Guidance: Recognize, Access and Use your Intuition for daily guidance with increased self confidence, clarity, and wisdom in everyday life and decisions. Spirit Guided Intuition: Recognizing, Accessing and Using your Intuition for increased self confidence, clarity, and direction that includes steps to spiritual mediumship for increased communication and connection that recognizes personal spirit guides and more. 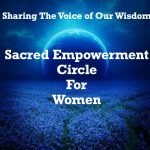 Empowered Intuition which combines both daily with spirit guidance that enhances the Way of the Wise Woman with increased intuitive skills that includes a more profound connection to your Authentic Self. How Empowered Intuition Development Sessions Provided? Empowered Intuition Development are one hour sessions provided by phone within the convenience of your home or personal space. Each personal Intuitive Power Session is designed to address personal issues of stress and concern that may be blocking your Intuition. Empowered Intuition Development follows the Empowered Intuition Three Core Step System of Merging, Knowing and BEcomimg your Intuitive Authentic Self. Merge –Simple, easy to use general pathways, meditation, centering and prayer techniques to merge, attune and align with the core energy of your intuition which is powered by your Authentic Self. Know – Developing the core steps of knowing which is identifying, accessing, trusting and interpreting your intuition with clarity as you merge with your Authentic Self. BEcoming –Learning how to merge The Empowered Intuition Core Three Step System into a state of BEing with increased intuitive power, self confidence, and profound state of personal well being. What Are the Benefits Empowered Intuition Development Sessions? You will experience deeper connection, clarity and self empowerment with your Intuitive Authentic Self. Within your Intuitive Power Sessions, you will begin to recognize and take action on specific intentions while gaining greater confidence in tapping into and interpreting your own intuitive guidance. You will become familiar with, trust and immediately begin the steps of accessing, trusting and BEing your Intuitive Authentic Self. Three Empowered Intuition Development Sessions which includes weekly email support and follow up. Six Empowered Intuition Development Sessions which includes weekly email support and follow up. Each Empowered Intuition Development Session is recorded and emailed to you within 24 hours after the call. Email of documented takeaways, tools and steps offered during the Empowered Intuition Development Sessions to have handy for your everyday use and clarification. Weekly email follow up and support between Empowered Intuition Development Sessions Monday through Friday from 9:00 am-6:00 pm. Note: The Three and Six Sessions of Empowered Intuition Development are designed only as weekly consecutive sessions spread out over whichever Sessions package you purchase to properly walk through the steps to recognizing, accessing and using your Intuition.